In this project you will perform graph manipulations and use the Python NetworkX library to solve problems on the graphs. You will use the Cytoscape to visualize large graphs. You will be working with synthetic data as well as real-life data generated by bioinformatics researchers. You will interpret results of graph clustering using standard metrics as well as biological knowledge. The first part of this project focuses on performing various operations on graphs, starting with an initial graph that you read from a file. As you generate each new graph, do not destroy the previous graph on which it is based. All operations make use of the NetworkX library and graph visualization tools. See Lab 11 for graph operations that may be useful (note that you can use any graph operation you find useful). bio_provided_sp09.py is the provided file. The graphs you manipulate are either read from a file or are generated by one of the NetworkX graph generators. The input graphs are undirected graphs, their edges have no weights, but nodes have names. You will be given a number of input files to process. Function import_edge_list(file_name) opens file file_name. The function returns a NetworkX object that represents this graph. Graphs are represented in files as a series of lines, with each line representing one edge in the graph. An edge is given by two entries representing the node names (there is a space between two node names). For the files that contain biological data, entries are of the form EBI-4766 EBI-6256, indicating an edge from node EBI-4766 to node EBI-6256. The Gavin data sets have thousands of entries and they should only be used once your code has been tested. NetworkX allows you to generate graphs (use methods in the package generators). These graphs may be useful when testing various parts of your code. After you read (or generate) the initial graph G, find the connected components of the graph. An undirected graph G is connected if for any two of its nodes a and b, there exists a path from node a to node b (which also implies a path from node b to a). Intuitively, in a connected graph one can travel along the edges from any node to any other node. If a graph is not connected, we are interested in identifying the largest subgraphs that are connected. We say two nodes a and b are in the same connected component if and only if there exists a path from a to b. NetworkX contains a number of algorithms to determine the connected components of a graph (see submodule networkx.component). Thus, you do not need to write code and can use methods from the NetworkX library. The library functions return a list of connected components. Each connected component is itself a list that contains the names of the nodes (EBI-4766, EBI-6256, etc.) that are connected. Below is an example of an undirected graph G consisting of 20 nodes and four connected components. The connected component algorithm will be applied to a given graph to determine the connected component having largest size in the graph. In the example, the connected subgraph containing node 11 represent the largest component (it has size 10). If there is more than one connected component of maximum size, the algorithm should not continue. In the data sets you will be given, having two connected components of the same size indicates a serious problem in the data sets. For this project, you have two tools with which to visual your graphs: NetworkX drawing routines and the Cytoscape application. NetworkX provides only very basic drawing support and drawing larger graphs (more than 40 nodes) can be very slow. We suggest using NetworkX only testing purposes and not for the biological data sets. Cytoscape is a state-of-the art software tool for visualizing graphs. The tool is designed for bioinformatics researchers to visualize molecular interaction networks and to integrate these networks with gene expression profiles. Cytoscape allows effective visualization of large graphs. It is interactive and gives a user control over layout specifics. Cytoscape is easy to download and to install. Use Cytoscape to visualize larger graphs (over 30 nodes). Assign colors to nodes such that all nodes belonging to the largest connected component have the same color. Cytoscape also allows you to visualize clusters found in large graphs. A brief tutorial is available on the basics of how to import and visualize graphs. It is not meant to replace the Cytoscape on-line tutorial. Cytoscape reads a graph from a file in the same format described above: each line in the file corresponds to an edge in the graph, in the form of “src dest” where src is the source node and dest is the destination node. Function export_edge_list() given in the provided file creates a file that can be input to Cytoscape. Clustering in graphs is the process of grouping nodes into sets, called clusters, so that nodes grouped into the same set are “similar” in some sense and nodes belonging to different sets are “dissimilar”. A node belongs to exactly one cluster. The definition of “similar” is often application-dependent, but a common goal is to separate sparsely connected subgraphs from dense ones. 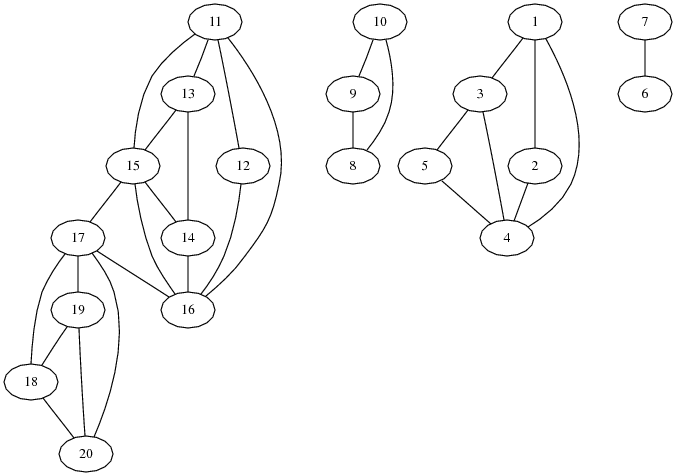 This separation can be done by identifying edges that disconnect the graph or by performing random walks in the graph to identify more densely connected subgraphs. You will be given code for a very effective and relatively simple clustering algorithm. The clustering algorithm operates on an undirected graph. The clustering algorithm used is known as the Markov Cluster (MCL) algorithm. It is based on making random walks in the graph to identify dense subgraphs. This algorithm is function mcl_clustering(G) in provided_code.py (do not change the code of mcl_clustering(G)). Those interested in reading how it works can find information at http://micans.org/mcl. Function mcl_clustering returns a list of lists, with each sublist representing a cluster made up of the given nodes. For any given input graph G, first find the connected components of graph G. Let GC be the subgroup of G corresponding to the largest connected component. The MCL clustering algorithm will be applied to graph GC. All other connected components of G will be ignored. Applying MCL clustering to graph GC generates a clustering CL represented as a list; each element of the list corresponds to one cluster. A cluster can contain a single node. Applying the MCL algorithm to the largest connected component of the above example generates two clusters, one consisting of six nodes and one consisting of four nodes. These two clusters are shown below. Given a clustering CL, the edges of the graph GC can be classified into “good” edges and “bad” edges. A good edge is an edge between two nodes in the same cluster. A bad edge is an edge between two nodes in different clusters. Observe that the quantity total_good + total_bad corresponds to the total number of edges in the graph. Intuitively, the larger the value of coverage, the better the quality of a clustering. Consider the cluster in our example graph: it contains 16 good edges and 2 bad edges. Hence, the coverage of the clustering is 16/18 = 0.89. The second metric we consider is called the performance of a clustering CL. In some sense, performance is a measure of the “correctly interpreted nodes.” Let missing_bad edges be the number of possible edges between nodes in different clusters that do not exist in GC. The larger the number of missing_bad edges, the better the clustering. Let n be the number of nodes in GC. Note that an undirected, simple graph consisting of n nodes can have at most n*(n-1)/2 edges, since in a simple graph, any pair of nodes can have at most one edge between them and no node may have an edge to itself. For our example graph we have missing_bad = 22 and we get performance = (16+22)/45 = 0.84. 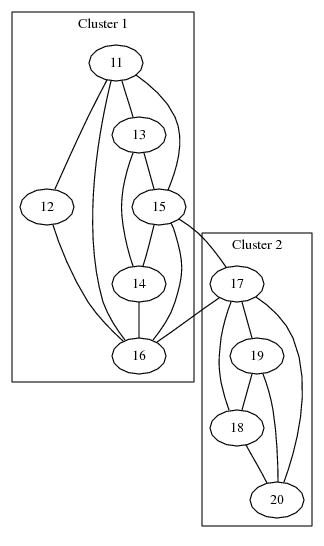 There are a total of 24 potential edges between clusters in GC (each node in the cluster of six can connect to four different nodes in the other cluster), but only 2 of these edges are actually in GC; thus, we derive missing_bad = 24 - 2 = 22. The plot below shows one possible way of illustrating coverage and performance. if G contains more than one connected component, generate a plot showing the sizes of the connected components ignored in later processing steps. This can be a histogram on the number of nodes in these components, or another presentation of this information you find illustrative. Visualize graphs G and GC in Cytoscape or NetworkX. Be sure to use Cytoscape for larger graphs. Visualize the largest connected component in graph G with differently colored nodes. Save the visualizations for Gavin and Ito (given below) in files with appropriate names and refer to them in your writeup. Use function mcl_clustering to determine a clustering of the nodes in graph GC. Generate an analysis of the clusters with respect to the number of clusters and the number of nodes in each cluster. Write a function coverage(G, C) to compute the coverage and a function performance(G, C) to compute the performance of a clustering C. Visualize coverage and performance in a single plot with appropriate labels. Run your code on graphs we provide after testing it using smaller graphs you create. Submit a file called my_graph_operations.py along with a folder containing your graph visualization files. Make sure this material is organized well (e.g., one subfolder per graph) and files of visuals have names that clearly identify what they represent. As a reminder, see Lab 11 for examples of graph operations and make use of the file bio_provided_sp09.py.